Hello, I am the new Tony Hillerman Digital Fellow; I joined the crew in August. As the new fellow I was initiated into the project by being assigned to work on People of Darkness. My job is to research and define terms from the novel that would contribute to the digital encyclopedia. 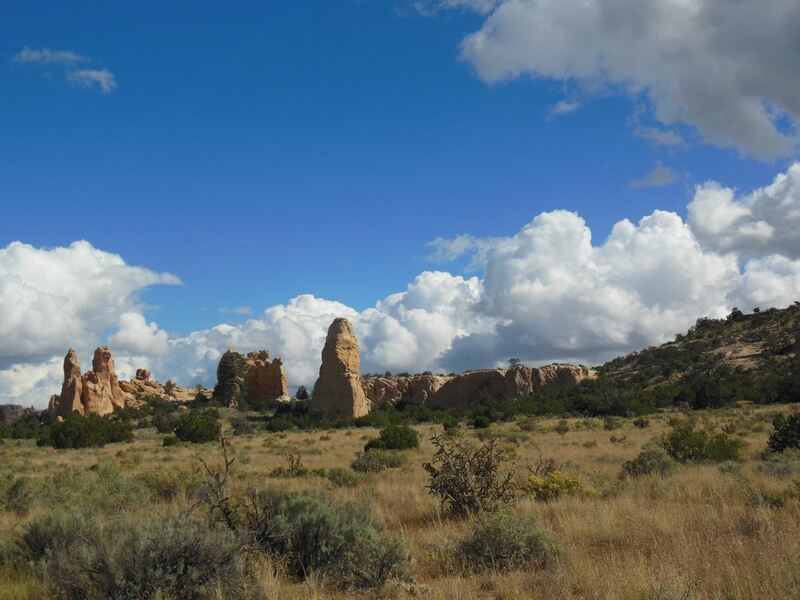 We have been taking terms from Hillerman’s books and, through these definitions, have been constructing a picture of the Southwest through Tony Hillerman’s eyes. People of Darkness takes place in the Grants, NM area: the checkerboard section of the Navajo reservation, Mount Taylor, and El Malpais. These were some of the very first terms I researched and defined for the encyclopedia. As it happened, just as I finished defining “Mount Taylor,” “Grants,” and “El Malpais,” a beautiful autumn weekend in late September presented itself as an opportunity for a camping getaway, and I decided it would be the perfect time to go explore landscape of People of Darkness in person, and on foot. It was Friday evening and already dusk when I arrived at the foothills of the mountain. I set up my tent in a quiet, deserted campsite, built a small campfire, and reread the first couple of chapters. Through the trees, in the dark, I could see the glowing, distant lights of a few secluded estates. Which one is B. J. Vines’ mansion? I wondered, imagining the wealthy villain’s house as Hillerman described it: the fireplace, the trophy heads on the walls, the grave of the “good Indian” Dillon Charley in the yard... The next morning, bright and early, I started my ascent of Mount Taylor. The air was cool and fragrant with the smell of juniper and pine, and the sky heavy with gray clouds. Soon enough I was sweating, trudging up, up, stopping occasionally to catch my breath and take pictures. Two hours later I was proudly standing at the very top of the sacred peak. Once I made it back to Grants, I drove through a run-down Main Street, got briefly back on Highway 4o, and then headed south to El Malpais. At the campsite’s picnic table I spent the evening reading some more, and the next day set out to explore the sandstone bluffs, the lava beds, the hoodoos and hidden caves. This is where the murder of Dillon Charley’s son took place. This is where the hired assassin Colton Wolf was chasing Jim Chee and Mary Landon, and where Chee suffered his nearly-fatal bullet wound. A rugged, lonely landscape, vast and empty but for the crows overhead and the ants underfoot. I hiked all day and the only souls I encountered past the trail-head parking area were a small darting rabbit and a large slithering rattler. Hillerman wrote about the Southwest, not only with knowledge and interest, but with deep love. It is a passion that seeps through the pages, contagious to readers all over the world. I feel fortunate to be living here in such close proximity to all the places he wrote about so lovingly. To see them in person, to travel through and hike this beautiful wilderness is to be inserted—for a fleeting yet memorable moment—into the crime scene, into the drama and inspiring magic of Hillerman’s world.